The second concept is two deck version that is point to point. It includes my key locations of Farmington (all three yards well represented), Strong, Kingfield (proper orientation with long stub), Bigelow, Phillips, Rangeley, Marbles and More. There is over 304′ of mainline yet ample open space so that it does not seem crowded. Most of the layout is double deck, but with 30% of the layout on mushroom operators can focus on their own trains. The concept has ample room to do Kingfield justice. On top of the orientation is correct so that Kingfield could loop correct. There would be some compression of the stub, near the turning mill, but the depot and engine house could be captured nearly completely. (This past summer I designed Kingfield to fit into Gary White’s space, I’ve pasted that version into the concept for reference). Strong has it’s natural curve to the left (going north from Farmington) and Phillips has it prototype curve to the right (going north from Strong). Farmington would stop 3-4 feet short of Starbirds, so that operators on the F&M could watch their trains come down from Kingfield to Strong, and back to the strong station. Strong would not have a backdrop, so that it could be viewed and operated from both sides. Likely, a duck-under would be provided for F&M operators at Strong to get to the other side to operate the turntable. If the duck-under is too low, they can always walk around out and around. The P&R from Phillips to Rangeley is extensive. At more than 125′ in length, this is a model railroad in itself. TT&TO ops could occur on that section alone. 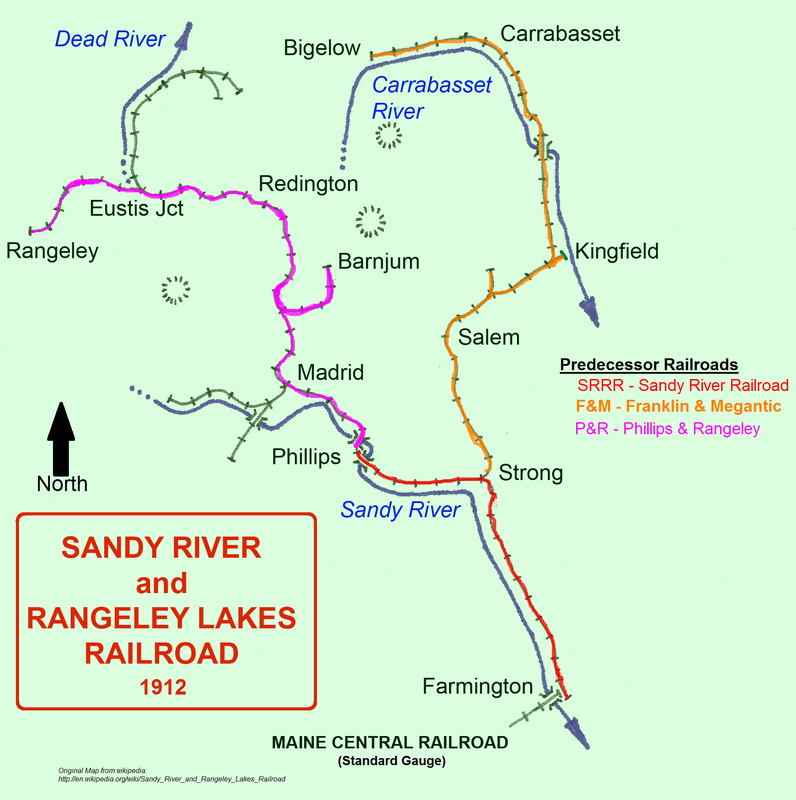 The SR&RL mixed and freight trains originated in Phillips and headed north to Rangeley. With all of the towns, it would be nice to get in one of the branches (Barnjam, Madrid, Eustis). However, the branches would be hard to represent, as the shelves are narrow and high. This layout is on a continuous grade around the outside of the room. The bottom is Bigelow (36″) and the top is Eustis (68″). A mild grade of 1.4% would connect the two locations. However, I want my towns to be level or near level for switching. So using the profile option within XTrkCad I was able to set new grades. Railroad profile for continuous grade around room and top of mushroom. Starts with Bigelow on left and ends with Rangely on the right. Click on image to see full size. Like the prototype, the grades are steeper on the branches. The track level between decks is kept at 16″. Thus the opening to view would be around 14″. Since much of the layout is 48″ or higher and narrow, I think 14″ is adequate. The entrance is crossed twice with the lowest being 36″. That is a concern. One way around that would be to shorten Bigelow and pull it away from the wall. Thus, entering the room around the back of Bigelow, with a duck-under only for the upper level. Even though I say duck-under, I expect to be a gate too. Of the major towns, only Bigelow and Kingfield are below my optimal viewing height. At 36″, Bigelow could be operated from a rolling chair and Kingfield a stool, thus easing the height challenge. Farmington, Strong, Phillips, and Madrid would all be at a good height. The 68″ top height is nearly acceptable to me (I’m 76″ tall). However, it does not work for my friends (as short as 69″) wife (65″) or 8 year old son (53″). He would only be able to see 1/3 of the lower deck. A 10-12″ step in the mushroom would alleviate some of the problems, but it causes new problems for me. There are two beams and a heating duck. I slide under them with 5-6″ of clearance so a 5″ step would be acceptable…but not work for my friends…So the only choice is to lower Bigelow to 30″. As for the challenge of my son’s height, I could start at the bottom and grow the layout up with him. Each crew would have it’s own engine, so that’s 10-12 locomotives (Note, only 5 are currently available). There’s plenty to do. Sessions could be broken into two sessions to represent a day. Besides just the layout construction, equipment and operations would be part of the phases, as I’d see operating at each phase. What if I run out of energy after Phase #1 or Phase #2? Never to build Phase #3? or stalling while doing some other project (such as…live steam, HO Free-mo modern diesels, S-scale or volunteer) I’d might never build Farmington or Strong (two of my favorite locations), instead I could end up building the P&R, my least favorite portion. A positive of the phasing is that the middle of the room would remain open. A second phasing option is to start with the Mushroom and build down to the location of Madrid. Build two parts (station and middle yard) of Farmington in Free-mo and keep moving it as the layout progresses. Here is how the phases would be. Phase 5: Rangeley, Carrabassett and Bigelow moved to proper location. This second approach is more natural progression, ensures the presence of a standard to narrow gauge junction at all phases. However, it does not go well for allowing my son to enjoy it. The early phases would be over my son’s head (not a way to capture young model railroaders). The second phasing option leaves the entrance open for several phases, and only crosses it a low level on the 5th phase. Strong, Phillips, Rangeley, Marbles all work well. Includes all major portions of the SR&RL, could not ask for more. Crosses entrance twice, with one time being so low as to force a gate.